Archlinux on gnome 3.30. Until the most recent update (3.28 -> 3.30) I used snd-aloop constantly to create a virtual sound device. After the update and a system reboot however it doesn't seem to work anymore. When I do sudo modprobe snd_aloop or sudo modprobe snd-aloop the command exits with 0. The output of lsmod shows snd_aloop too, however within pauvcontrol I can not select the virtual audio device. It's also not listed under the Output devices tab. Since lsmod shows the module loaded properly I'm not sure where to troubleshoot either. pactl list short sinks (and sources) don't show the virtual device either. 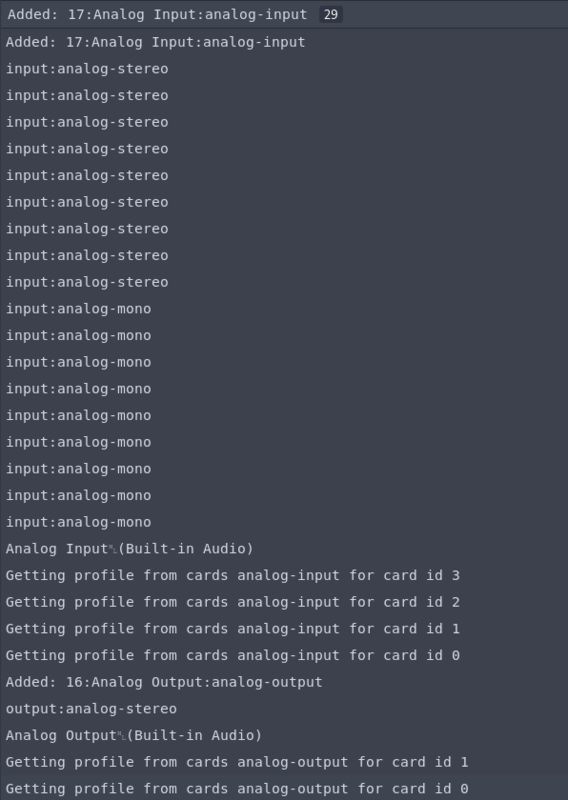 alsamixer shows loopback under /proc/asound/cards and it's in/out's under /proc/asound/devices. /proc/asound/pcm lists the virutal device too. What's worth noting is that when I try to use alsamixer to change the volume controls of the virtual soundcard, it says This sound device does not have any capture controls. which I think is weird since there should be two (reg. input and monitor, both listed in /proc/asound/devices). Note that everything else is working fine with my sound and pulseaudio. Browse other questions tagged arch-linux gnome audio pulseaudio alsa or ask your own question. How do I create a playback device under pavucontrol?